DRAW REVIEW: The draw in Vienna has determined all four groups for the Women's EHF Cup Group Phase. The record winners of the EHF Cup, Viborg HK will start their mission to claim the first title after the competition's reform in Group C together with the Polish champions Vistal Gdynia, Norwegian team Byasen Handball Elite and the Turkish champions Kastamonu Belediyesi GSK. 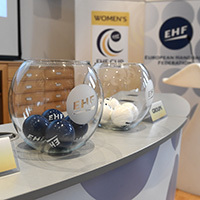 The draw in the EHF Office determined all four groups of the stage which is going to start on 6/7 January 2018. Markus Glaser, EHF Chief Sports Officer together with four club representatives (Andreaa Radoi from Craiova, Florene Dasse from Issy Paris, Henrik Dahl Nielsen from Viborg, Espen Nyhus from Larvik) also decided that another EHF Champions League winners Larvik will play in Group D together with H 65 Höörs HK from Sweden, Romania's HC Zalau and Baník Most from the Czech Republic. In Group A, Brest Bretagne Handball, who reached the quarter-final last season, will try to emulate the same feat against Denmark's Randers HK, SCM Craiova from Romania and Kuban from Russia. Group B consists of Vipers Kristiansand from Norway, Russia's Handball Club Lada, French side Issy Paris Hand and Denmark's Koebenhavn Haandbold. Group phase will be played in a round-robin system and after six rounds the top two teams of each group will reach the quarter-finals.